In today’s busy world, one of the most common excuses that people give when they are asked why they do not have a regular exercise routine is the lack of sufficient time. It is easy to think that you do not have enough room in your schedule to accommodate a formal daily exercise plan. But there are a lot of other and much simpler ways of improving your fitness level. One of these alternatives is walking. Walking is not a very demanding exercise. 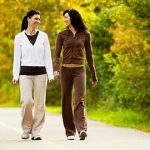 It is highly likely that you can actually achieve your walking exercise, as it does not require much preparation and it is for all ages. You can easily integrate it with what you do on your day-to-day life. For example, you can choose not to drive your vehicle or use the public transportation to get to work. If you can, just walk to get your dose of physical activity for today. Or rather than using the elevator, you can choose to take the stairs. These simple everyday choices can be your gradual and extremely easy way towards optimal health and wellness. Research has shown that walking gives you a ton of health benefits. It is a great workout for your heart to improve your cardiovascular wellness. It helps lower cholesterol levels and keeps you from the risk of developing type 2 (late onset) diabetes. Furthermore, walking also helps in burning fat and maintaining your ideal body weight. In addition, walking is also great for your brain. It has been found that people who took longer walks are less prone to dementia. All in all, the more steps that you take each day can help in making you live a longer and more enjoyable life. Walking requires you to be in touch with the rest of the world. As you go out for a walk, try to savour the scenery and enjoy the ambiance. In this way, your walks do not only serve as a physical activity. It also becomes a stress-busting endeavor that helps in improving your emotional wellness. Walking has been shown to facilitate the release of feel-good endorphins, which lift up your mood and chase away anxiety. Not only that, walking can also serve as a social activity. You can invite your family and friend to join you in your walks, so that all of you can appreciate the outdoors and stay healthy together. You are never to busy to be fit. Walking is a simple yet highly beneficial exercise. Try to make it a habit and enjoy the wondrous health benefits that it provides. For more expert tips on keeping your mind and body in excellent condition throughout your lifetime, consult your trusted Canberra chiropractor here at the Canberra Spine Centre. We are dedicated to helping you, and your entire family, achieve optimal health and wellness. Call us today on 02 6257 9400 or simply book your appointment online to experience the benefits of living the chiropractic lifestyle. Book online at spinecentre.com.au or call us on (02) 6257 9400.